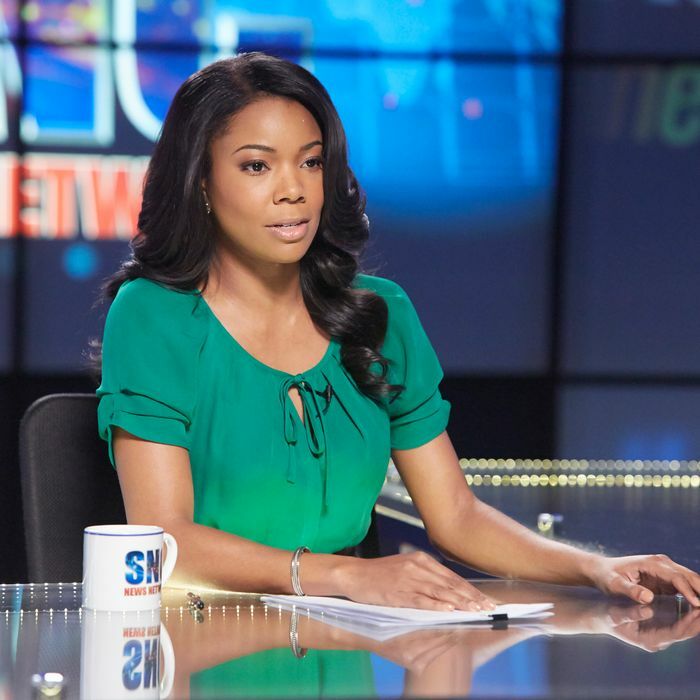 Over the summer, BET aired a movie-length pilot for its new scripted drama Being Mary Jane. Four million people watched Gabrielle Union star as news anchor Mary Jane Paul, the kind of heroine we’ve seen over and over in rom-coms and network dramas: an all-star in her professional life, but a mess everywhere else. She’s got a gorgeous house, gorgeous hair, a gorgeous wardrobe — and a monstrous personal life full of overly demanding family members, hunky suitors who are never who they seem to be, a ticking biological clock, and suicidal friends. Single and fabulous! Single and fabulous? There are so many familiar ideas and stories in BMJ, which premieres in earnest tonight at 10 p.m. on BET, that it’s easy to miss some of the show’s more daring and interesting moments. Mercifully, though, they’re in there. When we met Mary Jane over the summer, she found out that Andre, the guy she was dating — and really falling for — was married. And not “we’re separated and living apart”–style married. Like, married married. She flipped, he ran, and after a tense conversation with the guy’s wife, it seemed like MJ was moving on. Not so! Tonight’s episode finds Andre’s wife swinging by MJ’s workplace for a full-on showdown, but it’s not a “keep your hands off my man!” kind of deal. It’s more searching than that, more raw and desperate for both women. His wife asks direct, intimate, graphic, and serious questions, and Mary Jane answers each one directly, intimately, graphically, and seriously, but without contrition or anger. The scene is thrillingly frank, and it highlights why you might want Union to be the star of your show: She can communicate a lot of different ideas and feelings at once. MJ is bravely candid with this woman, but we can see the cracks in that bravery. She’s also humiliated, furious with both Andre and herself (how could I let myself believe in this? ), shocked at his wife’s audacity — but maybe a little impressed by it, too. She’s also not about to sell herself out, so at moments it seems like she’s bragging. Other times, though, I wanted to crawl into my TV and open a bottle of wine and hang out for a while. That’s creator Mara Brock Akil’s calling card, and something that defined her previous work on The Game and Girlfriends, shows with comfortable and authentic, though often very complicated, relationships and friendships. (Brock Akil’s frequent collaborator and husband, Salim Akil, is an executive producer and director on Being Mary Jane, too.) Mary Jane is a character I’m interested in, someone whose life I am curious about, someone I want to spend time with. She isn’t solving crimes, she isn’t a supernatural entity, and she isn’t someone’s sassy sidekick or some powerful man’s better half. Oh, and she’s black. This makes Mary Jane, and Being Mary Jane, a staggering rarity on television.